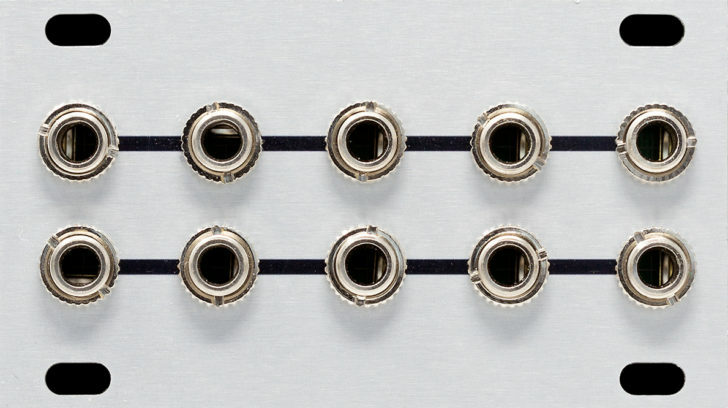 The Mult 1U takes one audio or CV signal input, and (mult)iplies to up to four outputs. Because the Mult is passive, it requires no power to operate. Multiply anything by four, twice. Mult is a dual five-way passive signal multiplier. Plug an audio or CV signal into any of the five top jacks, and Mult 1U sends an unbuffered version out the other four jacks in the group (thereby “multiplying” one signal into four). The bottom row duplicates this function, giving you two independent multipliers in a single module. Because the Mult is a passive module, it requires no power to operate. Two rows of 1 x 5 Passive Multing.